In a surprise reversal, on Friday, September 28, 2018, President Donald Trump ordered the FBI to reopen an investigation of his nominee for the Supreme Court, Judge Brett Kavanaugh. The FBI, under the leadership of Christopher Wray, now has a week to investigate the charges of teenage sexual assault that threaten to derail the candidacy of Kavanaugh, he of Georgetown Prep, Yale/Yale, a clerkship with retired Justice Anthony Kennedy, a stint in the Bush White House, a co-starring role in the Starr Report, and twelve years on the D.C. Circuit (apparently irreproachable, as far as his personal probity, apart from a preference for pretty clerks). So confident was Trump in his nominee, apparently, that he announced (by tweet) that White House counsel Don McGahn would be leaving his post after the Senate confirmed Kavanaugh. 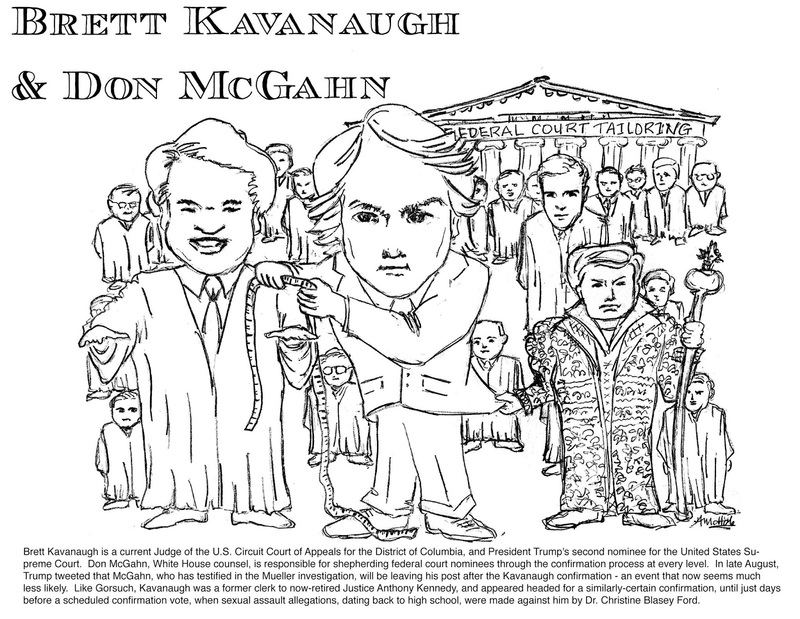 McGahn was set to retire having put two young, conservative, Federalist Society-approved former Justice Kennedy clerks on the Court for decades to come, along with a whopping 67 other federal judges (1/5 as many as Obama appointed in two full terms, and that also included just two Supreme Court justices, Sonia Sotomayor and Elena Kagan). As of June 2018, the nominees McGahn has successfully shepherded onto the federal bench are three-quarters male, and ninety percent White (along with being, unsurprisingly, more conservative than Obama's appointees). When Kavanaugh was first nominated, on July 9, 2018, a great deal of attention was (appropriately) paid to his expansive views of executive power, views that seemed to represent a reversal of his position when he was part of Ken Starr's team investigating Bill Clinton. As David Brock reported, Kavanaugh's virulent dislike of the Clintons - Bill and Hillary alike - is probably the trait he shares most in common with Trump. That - and his view that Presidents not named Clinton shouldn't be indicted. For a President worried about what the Mueller investigation might turn up (about him, about his family, about his campaign), a swing vote on the Supreme Court sympathetic to executive power must have seemed like a great insurance policy - and a big "win" for McGahn. Now all of that is in jeopardy. Trump's sustained attacks on the FBI may intersect interestingly with this investigation, and put Christopher Wray (like Kavanaugh, Yale/Yale, YLS '92, a 1L when Kavanaugh was a 3L), back in the cross-hairs. Earlier this month, Wray became a target of Trump's ire - but whether the results of this week's investigation will aggravate or allay that depends, presumably, on its results. It seems unlikely, however, that the investigation will confirm Kavanaugh's wildest conspiracy theories, that these allegations are "smears" brought by those seeking "revenge on behalf of the Clintons, " a notion about as plausible as Ed Whelan's "lookalike" nonsense. While the FBI interviews Kavanaugh's drinking buddies, one cannot but assume that the Republicans, including McGahn, will spend the week thinking about alternative nominees and the right "cover story" for dropping Kavanaugh. Sen. Mitch McConnell, the majority leader in the Senate, reportedly never favored him, preferring either Judge Raymond Kethledge (Michigan/Michigan, and a Kennedy clerk) or Judge Thomas Hardiman (Notre Dame/Georgetown, and - gasp! - never a clerk at all!). Back in early July, that more innocent time, McConnell's biggest concerns were about Kavanaugh's long paper trail, as a sitting judge and in the Bush White House, as well as his association with some now-unpopular Bush-era policies. In a general way, a Midwesterner with minimal East Coast-D.C. connections must be looking pretty good, and a more promising wrap-up for McGahn than this dumpster fire. Twice an alum of Notre Dame; a wife and mother of seven (two of whom were adopted from Haiti! and one is a special-needs child), she is a rock-solid Catholic conservative (and on-the-record opponent of Roe v. Wade) who promises to be a kinder gentler Scalia. She was only quite recently confirmed to the Seventh Circuit, so she's been vetted by this Senate - and probably has already de-clawed Sen. Dianne Feinstein, who managed to give herself a black eye with an apparently anti-religious/anti-Catholic remark about Barrett ("the dogma lives loudly within you"). In order not to surrender their recently-gained moral high ground, and avoid charges of hypocrisy, Democrats would need to "believe" Barrett, even if she dissembled about Roe and Obergefell. In the aftermath of Dr. Christine Blasey Ford's testimony, the GOP could offer a "healing" session of question-and-answer with Barrett, who, as a well-socialized White woman, would surely know better than to express any anger whatever she was asked; every Senator would have their own reasons to treat her "respectfully," and she them. We might find ourselves with a fourth woman on the Court, for the first time in history, along with the most conservative court in our lifetimes - and have Brett Kavanaugh's dishonesty and truculence to thank (or blame) for it. Stephen Colbert and John Oliver have released Trump/Pence related children's books that can be appreciated by adults too. Perhaps, they might appreciate this series. Sen. Howard Baker's question during Watergate about Nixon "What did he know, and when did he know it?" might be asked of WH Counsel Don McDahn concerning Judge K's high school (and later) drinking and claims of sexual abuse in shepherding Judge K's nomination/confirmation. It seems the drinking was no secret in the District area, including by Judge K's own statements over the years. Add to this Judge K's admission in his Committee testimony of his then and current feelings about beer. Query: Was Judge K a latch-key kid from the age of 10 through high school? His mom started law school when he was 10 and she was a Montgomery County prosecutor during Judge K's high school days. The Kavanaugh manse was in Chevy Chase, which is in Montgomery County. About the time Judge K had been nominated, there had been reports that Justice Kennedy wished to be succeeded by his former law clerk, Judge K, with some suggestions of a condition for his retirement. I don't recall such reports being fully put to rest, but there was no follow up, and little was said about this. But I noted that following last Thursday's Committee hearing, some commentators mad passing references to such earlier reports. Those reports may never be put to rest. Judge K has not been redemptive. Without redemption there can be no recovering, even as a Justice. Before I decide how to color WH Counsel Don McGahn I'd like more info on his specific directions to the FBI for its background investigative task on the Judge K confirmation process in the Senate following last Thursday's Committee hearing. Reports indicate that McGahn is not giving the FBI the "free rein" that Trump tweeted. Rather, McGahn may be reigning over the investigation to avoid the FBI raining on Judge K's parade to SCOTUS. Might Special Counsel Mueller consider further questioning of WH Counsel Don McGahn about the thorough nationwide search for a successor for retiring Justice Kennedy being completed upon becoming aware of Judge K's positions on the Executive that might impact on the validity of Special Counsel Mueller's appointment and subsequent investigations?